the Knotted Home: The Maker Series: Katiedid & Co. 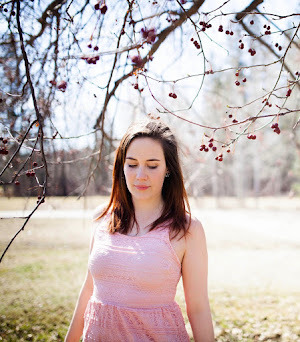 The Maker Series: Katiedid & Co. Happy Wednesday, Darlings! I have always been inspired by the art of embroidery. It is beautiful, elegant, timeless. 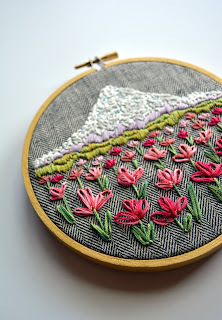 Today's Maker is someone whose embroidery I fell in love with at first glance. 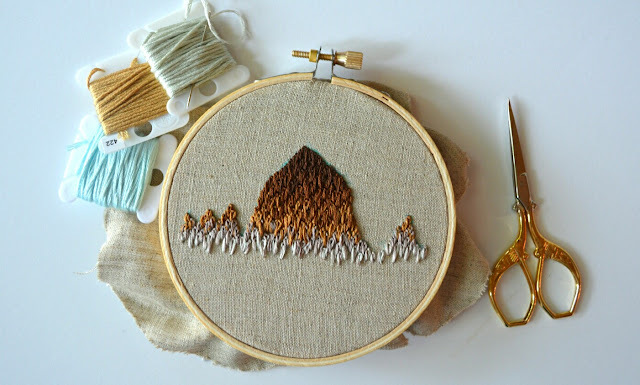 Her use of thread to bring about texture and movement is wonderful and I feel as if she could capture any scene that she sees and leave it imprinted on wooden hoops. 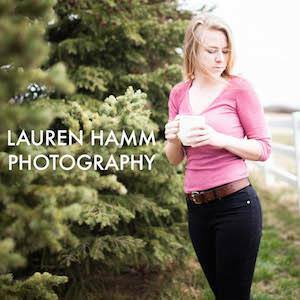 I am so happy and proud to introduce this next lady on the Maker Series : Katiedid & Co. I grew up in a relatively creative family. My parents always encouraged and appreciated my siblings and I’s creative endeavors. Throughout my life art has been something that I frequently turned to during especially difficult periods. I spent much of high school taking as many art classes as possible, dabbling in both ceramics and acrylic paint. In college I taught myself the basics of embroidery. I had decided on it as a creative outlet because it was a relative cheap hobby for a poor college student! It wasn’t until I had started my career in healthcare that I began really digging into embroidery. Anyone who works in the healthcare field is familiar with the physical and emotional toll it can take on a person. My initial reaction was to take a nap for several hours after work every day. It was not a healthy habit whatsoever! So I finally took the advice I frequently give to the people I work with - always keep something you enjoy in your daily routine. 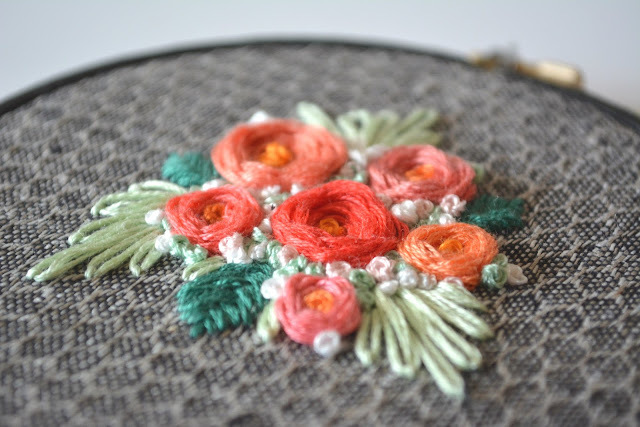 Embroidery became the enjoyable experience I looked forward to each day. It enabled me to take the stress of work and develop it into something productive and beautiful. My work is still stressful and at times overwhelming, but during my most stressful weeks is when I feel most motivated to stitch something new. It reenergizes me when I am able to take some time and think of a new design or learn a new embroidery technique. That is how Katiedid & Co. came into existence. It was a way for me to share my projects and stretch myself personally, all while finding some balance with work. Much of my inspiration comes from living in the Pacific Northwest. I’ve been spoiled to have been surrounded by beautiful evergreens, mountains and beaches my whole life. 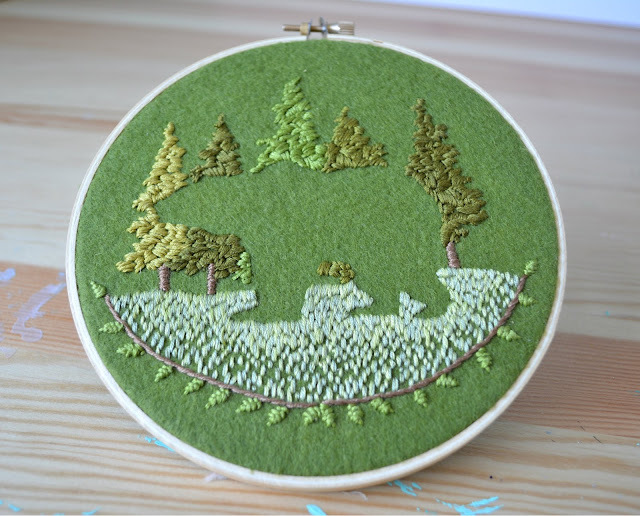 Each of my nature inspired hoop designs has a lot of personal attachment for me. It’s a rewarding experience to have others connect and share that same kind of nostalgia for I hold dear. Since sharing my work I’ve been able to connect with many creative women who inspire me in how they create and run a small business. They consistently inspire me to keep thinking of new designs and stretch myself creatively. So often creativity can become a competition, and it’s such a shame as everyone has something a little different to offer. I’ve been fortunate to find a community of women who support one another and cheer each other one with their success. It has been such a rewarding experience since beginning Katiedid & Co. a little over one year ago. Like anything worthwhile it comes with its own challenges, but I can easily say that I feel healthier now than I did before because I have an outlet to relieve the stress of work. I’m all for a healthy balance, so I encourage you, if you’re feeling like you need an outlet for the day-to-day stress of life, go for it! Do something you enjoy. Think creatively. It’ll be completely worth it in the end. 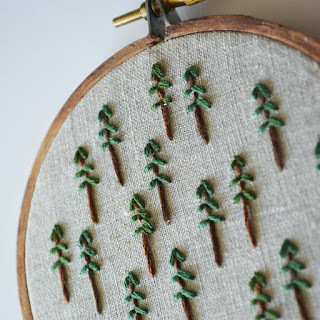 Oh, I just love her embroidery! Please feel free to head over to Katie's store and her Instagram. I am in love with this piece as well as this one, and I cannot wait to see what she brings out for Christmas! Thank you so much, Katie, for letting us hear what inspires you.